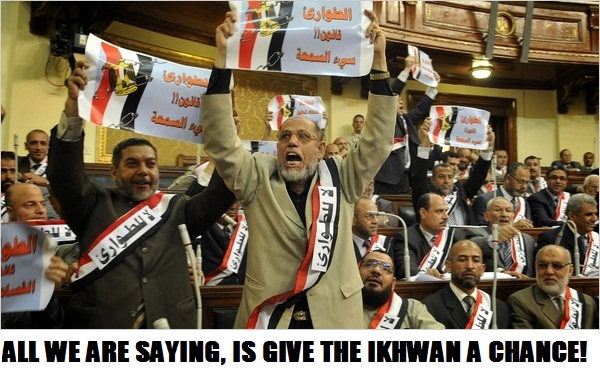 AS PREDICTED, ISLAMIC FUNDAMENTALISTS WIN 80% IN UPPER PARLIAMENT VOTE……. – The Tundra Tabloids……. AS PREDICTED, ISLAMIC FUNDAMENTALISTS WIN 80% IN UPPER PARLIAMENT VOTE……. Stick in the fork, Egypt is done. Islamist parties won more than 80 percent of seats in Egypt’s upper house of parliament, the country’s election board announced Sunday.The Muslim Brotherhood’s Freedom and Justice Party took 58 percent of the seats in contention, while the harder-line Salafist Al-Nour party came in second with a quarter of all seats. The nationalist Wafd party came in third with just 7 percent of the vote.The upper house, or Shura Council, has no legislative powers and fulfills a largely ceremonial function. Two-thirds of its 270 are elected, and the rest filled by government appointment. Voter turnout was low for the upper house, which will hold its first session Tuesday. Previous Post Previous Post ISRAEL SELLS 1.6 BILLION IN ARMS TO AZERBAIJAN, IRANIAN HEGEMONY TAKES A BIG HIT……..
Next Post Next Post REPORT SAYS INTERNET RADICALIZES MUSLIMS IN THE US…….